The USDA National Organic Standards prohibit the use of GMOs. 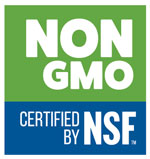 Choose products with the Non-GMO Project Verified or NSF Non-GMO Certified logo. In North America, only eleven crops from GMO seed are available commercially. They are sugar beets, canola, soy, cotton, corn, zucchini, yellow summer squash, potatoes, alfalfa (animal feed variety only), papaya and apples (Arctic brand only). Milk, cheese, eggs, meat and poultry could all be from animals that were given GMO feed. If concerned, choose organic or non-GMO verified. The five most prevalent GMO crops of corn, canola, soy, cotton and sugar beets end up as additives in all kinds of packaged foods as corn syrup, oil, sugar, flavoring agents, thickeners and hundreds of other ingredients. Choose organic or non-GMO verified. Most frozen fruits and vegetables are non-GMO unless from one of these five high-risk crops: corn, Hawaiian papaya, edamame (soybeans), zucchini and yellow summer squash. Choose organic or non-GMO verified for those five and watch out for other ingredients that might be from a risk crop. The USDA National Organic Standards prohibit GMOs. We work to provide organic or verified non-GMO versions of the five high-risk produce items in our stores whenever possible. GMO Arctic brand apples are available on the market. Whole Foods Market does not and will not carry these. Limited varieties of GMO potatoes are in commercial production, but in very small amounts. Choose organic if concerned. Milk, cheese, eggs, meat and poultry could be from animals that were fed GMO feed. If concerned, choose organic or non-GMO verified. The five most prevalent GMO crops of corn, canola, soy, cotton and sugar beets end up as additives in all kinds of packaged foods as corn syrup, oil, sugar, flavoring agents, thickeners and other ingredients. Most frozen fruits and vegetables are non-GMO unless they are or contain one of these high-risk crops or their ingredient derivatives: corn, papaya, cotton, sugar beets, soy (edamame/soybeans), canola, cotton, zucchini and yellow summer squash. As long as you avoid corn and soy, whole grains, beans, nuts and seeds are a great way to go non-GMO. Animals eat soy, corn and alfalfa that can be grown from GMO seed. GMOs are prevalent in the commodity grain market — 94% of soy and 93% of corn crops. There is limited availability of verified non-GMO feed at this time, but demand is encouraging more. All of our 365 Everyday Value® brand eggs are Non-GMO Project Verified or organic. Both of these designations require that hens are fed non-GMO feed. There is limited availability of verified Non-GMO feed at this time. We have an unmatched selection of wild seafood from fisheries that are well managed to maintain healthy fish populations and ecosystems. Farming these species doesn’t require any supplemental feed, so there are no GMO ingredients to worry about. There are no USDA organic standards for seafood yet. Currently, feed for farmed fish in the U.S. could contain GMOs because feed ingredients typically include corn or soy, and GMOs are prevalent in those crops in the U.S.
Farm-raised genetically engineered salmon are sold in some markets. Not ours. Our Aquaculture Standards prohibit genetically engineered fish. Grapes and the grains used to make beer are not typically GMO. Wine and beer use yeast in their processing and some commercially available yeasts are GMO. All wine and beer that is either “organic” or “made with organic” or non-GMO verified must use non-GMO yeast. Many spirits are made with corn; look for organic to avoid GMO corn. Look at the ingredient lists and avoid items that contain one of these high-risk crops or their ingredient derivatives: corn, papaya, sugar beets, soy (edamame/soybeans), canola, cotton, zucchini and yellow summer squash. When we use canola oil in our own kitchens, we use expeller-pressed, non-GMO canola oil. The five most prevalent GMO crops of corn, canola, soy, cotton and sugar beets end up as additives in all kinds of foods as corn syrup, oil, sugar, flavoring agents, thickeners and other ingredients. Areas of highest GMO risk in bakery include canola, soy, corn and dairy ingredients. The best way to avoid GMOs in these products is either to buy certified organic or to choose non-GMO verified items. Choose products with the Non-GMO Project Verified or NSF Non-GMO Certified logo. You may also see supplements with an IGEN certification mark that signifies a product has been tested for GMO content. Due to a very complex supply chain, there are fewer organic and non-GMO verified body care and supplement products than there are food products. High-risk soy- and corn-based ingredients and micro ingredients in supplements are difficult to address. The supply of non-GMO sources is extremely limited for supplements.